Despite an encouraging PET/CT report from Tuesday's trip to OHSU, a CT scan taken at Good Sam on Saturday showed a large tumor on the right side of Peter's brain located in his parietal and temporal lobes. Because of its size and the swelling caused by it, Peter is undergoing surgery to remove it today in Providence Portland Medical Center. Because melanoma brain tumors bleed, there is a lot of blood clotting in the area surrounding the tumor, which will also be removed. 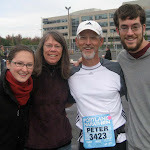 We are thankful that the tumor is on the right side of the brain, Peter's nondominant side. This means his speech and memory should remain unaffected by the surgery. We expect Peter to be in the ICU for the next couple days as he recuperates and is monitored closely. Hold him in your prayers. 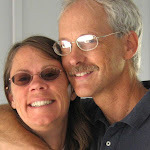 I don't know him or his family, but have been reading his blog since I was diagnosed with a melanoma recurrence. I am so sorry to hear this, but will pray for his healing and for you all! sending warmest thoughts to Peter and his family. All of us who read Peter's blog regularly are very much thinking of you right now. Peter is one of the strongest out there and an inspiration to those of us who are battling this terrible disease. Peter, the Wagner family is sending tons of prayers to you and hope the surgery is successful!! Needless to say this was quite a shock when we heard it announced at church on Sunday. We started the service with prayer as Peter was already in surgery. The updates today from church staff are encouraging given the series of events over the last few days. Our prayers are with you and family Nick. Thanks for the update. Please let us know how the surgery went. Glad to hear news is encouraging. My prayers are with Peter and family.